A good family pet comes when called, every time! Teaching a young puppy or dog that coming to you is a good thing will make both "their life" and "your life" a lot happier. It is no fun to chase your dog down the street terrified that he will get hit by a car. When you follow through with the training provided, you will live with a dog that listens and is a joy to own. You will learn how to make sure your dog does not pull on the leash ever! We are sure you have seen or experienced a dog who drags their owner down the street. This makes walking the dog an unpleasant task. If walking your dog is unpleasant, you will not want to take them for a walk. 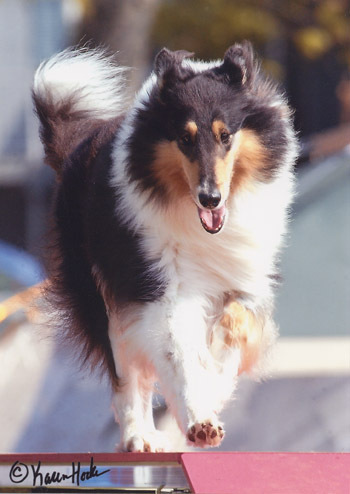 When a dog does not get the exercise they need, many unwanted behavior problems occur. Learn how to teach your puppy or dog to walk on a loose leash so that the both of you have fun getting some exercise! No one likes to have a dog jump all over them, even when it is his/her own dog. Learn how to teach your puppy or dog not to jump up unless invited. The command "OFF" is one that if taught properly makes owning a dog a lot more enjoyable. Starting OFF with a puppy is a lot easier than waiting until you have a full grown dog. This is a command that every dog should learn. There is nothing like having a dog that will stay put when told. There are times in life when we would like our puppy to be quiet and under control. Learn how to get your puppy or dog in a curled down position and how to keep him there. 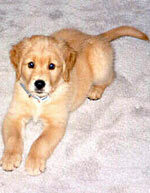 A well trained puppy or dog is taught to how to meet people respectfully. Your friends and family will be amazed at how well your dog listens to you. You will be proud to show off your dog, instead of being embarrassed by him. This is a command you will be happy you taught! Your puppy will learn not to try and push by you at the door. He will learn to wait and let you go through the door first. He will not jump out of the car unless you give him permission. This will safe your puppy's life. Many dogs get killed every day by sneaking out an open door. Learn this command so that you keep your pup safe! This is another command every new puppy or dog needs to learn. There are times when we either drop something on the floor, or see something that we do not want our puppy to have. Teaching your pup to leave it, makes life with them so much more enjoyable. $50 deposit required to register and hold a space for the next session. A new Session is tentatively scheduled for Monday April 22, 2019 @ 7:30 p.m. Sorry this class has filled!!! Tuesday May 7, 2019 @ 6:30 P.M Now taking Deposits for this class!!! Call us about Canine Good Citizen Classes (CGC) Now taking Deposits!!! *ALL STARTING DATES ARE TENTATIVE subject to a minimum of 6 registered dogs before a new session can begin. This is a 8 week session that is a must for any adult or older puppy. You can always teach an older dog new behaviors. So if you are tired of your dog ruling the house, this class will teach you to become the leader. A trained dog is so much more fun to own, and will allow your dog to live a better quality of life. No one wants to be pulled down the street, jumped all over, or to have to chase after his dog if he gets loose. Dogs who misbehave have a poor quality of life, their bad behavior keeps them from being an integral part of the household. The right training will teach your dog good behaviors and when he responds with correct behaviors, you will want to spend more time with him. This time together will enrich your dog's quality of life. Come and learn how to train a pet you will be proud of, you owe it to yourself and your dog. You will learn the same commands as the puppy class listed above! This is an eight week class that is a must for any dog or puppy that wants to get the best start on the road to an agility career. Whether you are highly competitive or not this is the class for you. You will end up with a dog that wants to play, chase, and pay attention to you. 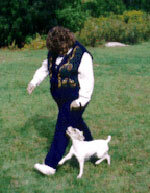 Your dog will learn all the handling skills he needs to build a wonderful working relationship with you. Your dog will learn the following commands, come to either the right or left side, turn away from you, go straight ahead, come in to you, get out away from you, circle you both right and left, table count game, start line game, and much more. This class is guaranteed to be both fun and informative! These classes are each six weeks long. Skills One is geared to help you master both front and rear crosses. You will learn how to treadle between jumps, how to do a beautiful serpentine, 180 and 270 degree turns. Teach your dog how to "get out," push and to "come in" pull to you. You will learn all these skills and much more. Skills Two will pick up from what you have already learned in skills one and will teach your dog to work at a distance. This is perfect for those of you who have a Velcro dog or for any handler that wants or needs their dog to work away from them. You must take Skills One first as what you have learned in that class will enable you to learn more advanced skills needed in distance work. Have you ever seen those handlers who have dogs that work away from their handlers and wondered how they do that? This class will teach you how they do that! 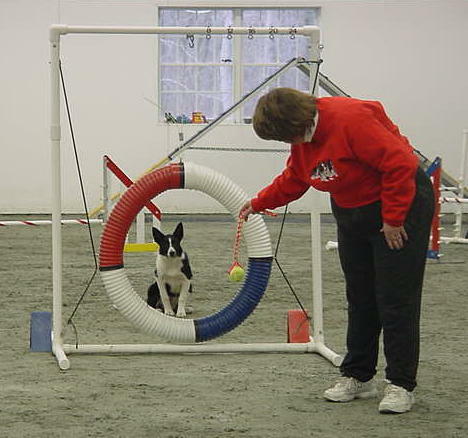 This is a on going class for those handlers who are proficient on all the agility equipment. 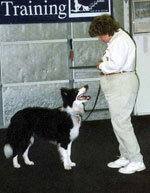 In this class handlers run anything from difficult sequences to whole courses. Each week skills are worked in an atmosphere of fun and learning. Handlers get a chance to run courses in a space much similar to the ring. This allows you to train like you show. You will run standard and jumpers courses. You can bet you and your dog will go home tired and happy! In this class you will begin doing sequences and learning all the skills you need to get ready for the show. Front crosses rear crosses, go on, and get out skills you learned in the attention games class are applied to the equipment in sequences. You and your dog will learn to become a team! You will begin to learn how to walk courses and how to run them! This class will get you ready for the advanced class. A nested course featuring novice, open, and excellent will be set up each week. Pick your own course and run it. This class is an hour and a half and you can run the same course or a different one as time allows depending upon the number of handlers attending. A great way to get ready for a weekend of shows. $20.00 per class. This is a six week session designed to get your dog to want to pay attention to you. This class is great for any handler who wants his dog or puppy to be happy and bright in the ring. If your dog is bored with obedience and needs some fun put into working with you, this is the class for you. Have you ever been jealous of handlers who walk into the ring with a happy attentive dog? Then stop complaining and come and learn how to get your dog to work with a happy attitude. Learn how to get and keep your dog's attention and how to play with your dog. This is a six week session for those who have successfully completed "Attention Games for Obedience I ". The course will continue with the skills developed previously. This is an brand new 8 week attention program geared for Competition Obedience dog. Learn how to get and keep your dog's attention among distractions. Learn how to become interesting so your dog will want to pay attention to you. You will finally understand What attention is really all about. 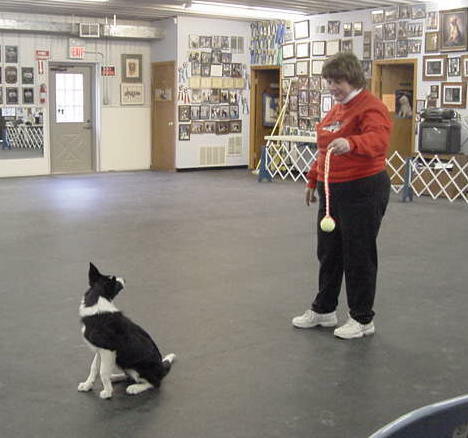 Come and learn from the the nation's leading authority on heeling and attention! 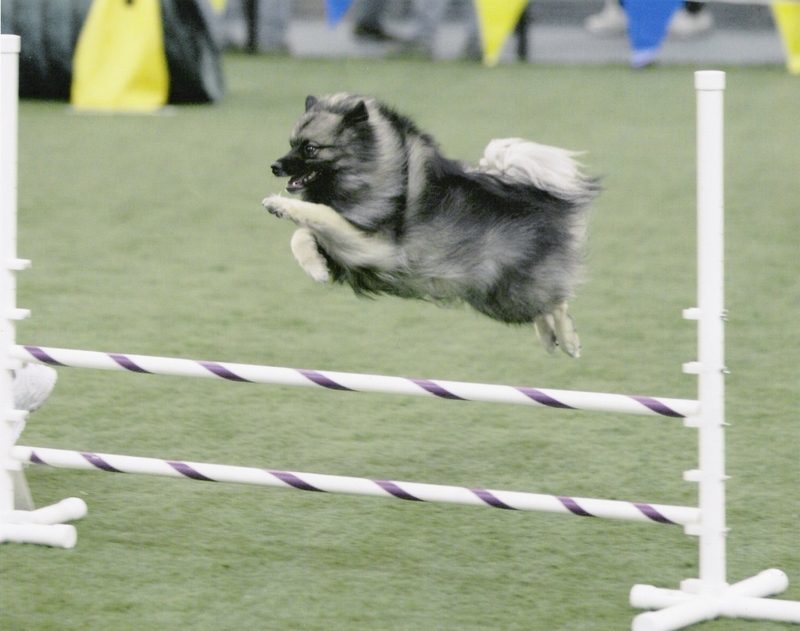 This class is a must for every competition obedience person! Not all classes are held weekly. If you are interested in a particular class please call Steppin'Up to have your name placed on the class list! Check the class schedule to see what classes are being offered. We look forward to working with both you and your dog!